Tough break Indians fans. You came so close to snapping 68 years of futility on the diamond, only to have those World Series hopes snuffed out in extra innings in Game 7 – even after holding a 3-1 series lead over those pesky Cubs. While your heart may hurt you wallet doesn’t have to. Your friends at Sportsbettingonline.ag are forgiving all losing wagers on Cleveland made by customers registered in Ohio during the World Series. That’s right Ohio bettors, losing bets on the Tribe in Games 3, 4, 6 and 7 and any future bets on the Indians to win the World Series will be refunded and returned to your accounts – no questions asked. It’s the least we can do after a rough loss like this. 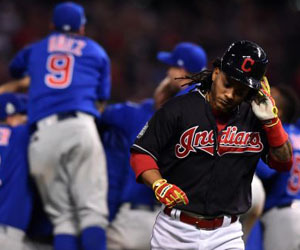 The Indians entered Game 7 as a home underdog with Corey Kluber on the mound Wednesday, and while the majority of wagers were on Chicago – driving the Cubs’ moneyline price up – there was significant support for the Tribe from bettors that call the “Buckeye State” home. Sportsbettingonline.ag has never issued a refund of this scale for an entire postseason series but has a reputation in the sports gaming industry for issuing similar refunds for bad beats, returning losing wagers to customers dealing with a crushing loss. Visit Sportsbettingonline.ag for all your sports betting action, from the baseball diamond and beyond.